I had to reinstall WebCore because it wasn’t using git. It deleted all of my pistons. I used the ‘backup pistons’ feature before doing it, but now I see that there’s no way to import. What’s the file format? I have my password and would just like to get the text of the pistons out of the file. I can’t answer on the restoring of pistons. But I can tell you that you didn’t need to uninstall webcore. You could have added the webcore github settings and linked it to your existing webcore apps in IDE. It wasn’t giving me the option to update the existing 4 webcore entries (they were setup manually I guess - not sure why I’d do that). Things seem kind of funky after switching over to the Samsung login system. If you click on properties of a smartapp in IDE and then go to the source code options, there is the option to link a github repository to that smartapp, then save at the bottom. Then you are able to update from repo to update those apps. Hopefully one the the minions will be able to help you restore your pistons. Ugh, thanks… should have looked around in the options first. Yah the backup files are fairly useless as no import feature. Looking at the backup to file feature, it would certainly benefit from a warning as it’s always been a work in progress. Unfortunately I don’t have any of the backup codes for those pistons. I rewrote the pistons last night… so no huge loss (and I’ve stored my backup codes now). Yeah, a disclaimer or just disabling that item in the UI might be nice. Submitted https://github.com/ady624/webCoRE/issues/67. Will try to make a patch. Anyone know of a way to download all your piston backup codes without having to go into each piston to get the code? Should we be saving the green or red backup codes? Do we need to save the new code each time we edit the piston? 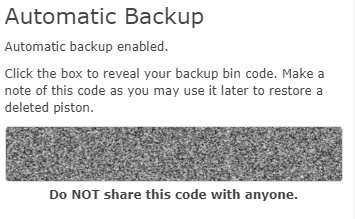 I have been going into the piston (not edit mode) and clicking on the shaded area and the backup code appears. This is the one I have been saving to a spreadsheet. (Only halfway through at the moment). I’m assuming this one does not change. If you still have the backup and the password that was used to encrypt it I may be able to help you recover these pistons. The backup data includes the backup bin code for each piston so while the backup file itself cannot be imported we should be able to work with the bin codes. I started a private message with you, please reply there if you would like to try that. Quick follow up here to confirm that the ability to restore from a backup file has been developed and is in testing. @fred909 and a few others facing issues with recovering pistons have been invited to try it out. Needs some work still but this should appear in the next webCoRE release.